FG, Transparency Intl, others kick as CCT discharges Saraki – Royal Times of Nigeria. The Presidency on Wednesday described the Code of Conduct Tribunal’s ruling on Senate President Bukola Saraki as a mockery of the anti-corruption war, Punch reports. 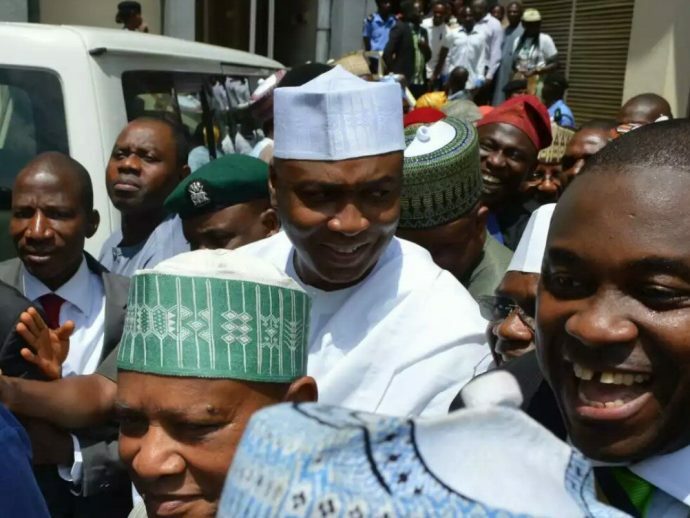 The CCT on Wednesday upheld the no-case submission of the Senate President, discharging him of all the 18 charges filed against him. The Special Assistant to the President on Prosecution, Okoi Obono-Obla, wondered why the CCT dismissed the weight of overwhelming evidence against Saraki, who was tried for false asset declaration by the Federal Government. Lead counsel for the prosecution on Wednesday, Pius Akutah, told journalists that the prosecution would review the ruling in order to determine the next step. Meanwhile, the Transparency International (Nigeria), described the acquittal at the CCT as a calculated attempt to downplay the anti-corruption fight in Nigeria. The Head of the Nigeria chapter of TI, Auwal Musa-Rafsanjani said that what transpired at the CCT was a clear indication that Nigeria’s corrupt elite are united and will stop at nothing to circumvent the system. Musa-Rafsanjani said; “It is another sad day for the anti-corruption fight in Nigeria. I think Nigerians are sad that this has happened. It just goes to show that Nigeria’s corrupt elite are united. “To take advantage of the system is their thing; they will continue to connive against the Nigerian people. They have no regard for ethno-religious or party affiliation, the corrupt Nigerian elite are united in perpetuating violence and plundering our resources to perpetuate themselves in power. Also, a chieftain of the defunct National Democratic Coalition, Ayo Opadokun, among others, described the judgment as a calculated attempt to frustrate the war against corruption in Nigeria.